Obviously I'm on a veggie soup kick these days. The carrot cauliflower soup last week was a big hit (both on the blog and in my belly), so I decided to give it an encore this week. 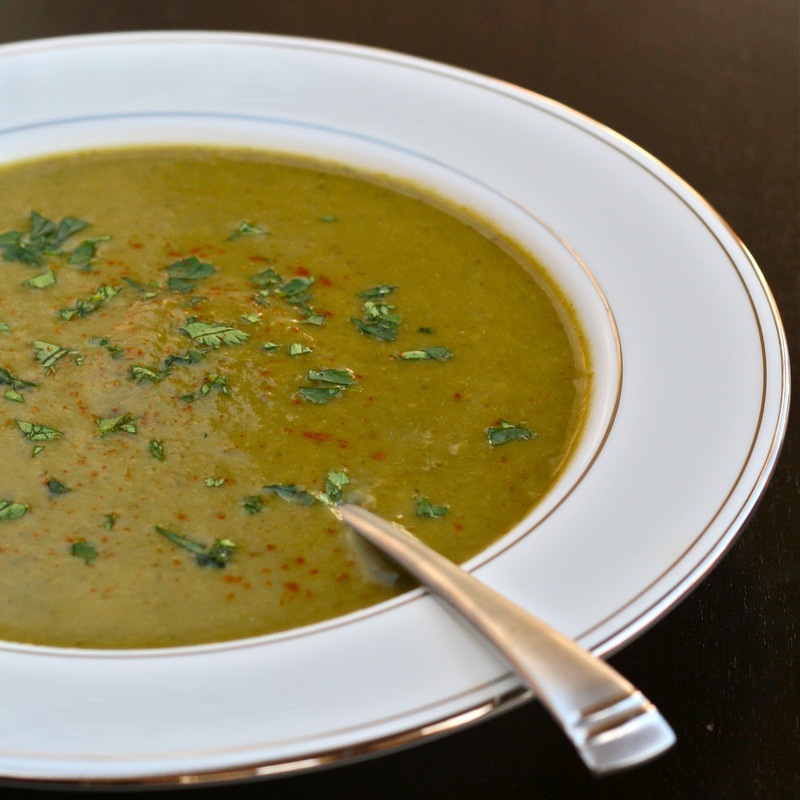 I received a bunch of green veggies in my CSA bag, so I decided to make quick use of several of them in this delicious and very nutritious green soup. I did a combo of asparagus, broccoli and kale. Talk about your daily dose of essential vitamins and minerals! Asparagus: contains loads of folate, potassium and antioxidants and is a good source of vitamin C. Broccoli: protects against cancer, promotes stomach health, high in calcium, and boosts immune system. Cayenne Pepper: stimulates digestion and muscle movement in the intestines, which helps to aid absorption of food nutrients. Kale: a member of the cabbage family and contains extremely high amount of chlorophyll, iron, calcium and Vitamin A. It is great for the stomach and full of nutrients. Olive Oil: protects against heart disease, can lower blood pressure, rich in polyphenols which act as antioxidants and anti-inflammatory. Saute some onion and garlic in a little olive oil until soft. Stir in your chopped green veggies and cover with chicken broth. Simmer on low heat until veggies are soft. (Avoid boiling to retain all of the nutrients we just talked about above). Once veggies are cooked, puree using either an immersion blender (preferred) or a regular blender, working in batches. (And yes, it sort of ends up resembling baby food, but trust me, it's delicious). Remember the zucchini cups from last week? 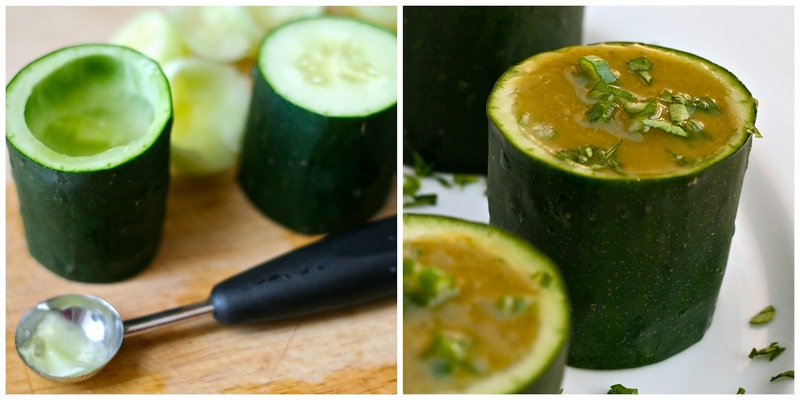 I thought cucumber cups would be an adorable way to serve this soup for an appetizer at a party. It would even work as a cold soup in this case. Otherwise, serve hot in bowls garnished with chives or parsley and sprinkled with paprika. A swirl of creme fraiche would also be yummy! Trim woody ends from asparagus, and chop into 3/4" pieces. Cut broccoli into florets. Remove ribs from kale and tear into large pieces. Heat olive oil over medium heat in a medium stockpot. Saute garlic and onion until soft. Add veggies, cook a couple more minutes. Cover veggies with broth and reduce to low heat. Cover with lid and simmer until veggies are soft (about an hour), taking care not to boil them. Tried this soup last week and absolutely loved it! Sprinkled a little parm on it and ate it with toasted rye bread! Thanks for sharing.